Section headings and selected papers: Keynote Addresses. Knowledge-based vision systems in real-time control, M G Rodd & Q M Wu. Distributed estimation, inferencing and multi-sensor data fusion for real-time supervisory control, C J Harris. Architectural Issues. Distributed intelligent objects in an architecture for real-time monitoring and control, V Lun & I M Macleod. Knowledge-Acquisition and Learning. A clustering method of knowledge acquisition in a real-time control system, Yu-Ji Huang. Techniques. An extended feedback structure of intelligent computer-aided control systems design based on object-oriented language, O Ono. 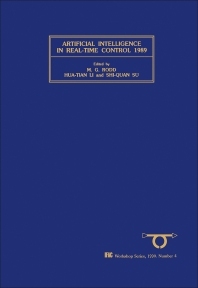 An expert self-learning fuzzy controller, Yu-Lan Zhou & Zhengyue Qiu. Scheduling, Monitoring and Management. Neural network based real-time production scheduling for industrial processes, Li-Wei Bao & Yong-Zai Lu. Application Studies. Application of expert fuzzy controller in the penicillin fermentation processes, E-Hui Xu et al. Author index. Keyword index. Papers presented at the workshop are representative of the state-of-the art of artificial intelligence in real-time control. The issues covered included the use of AI methods in the design, implementation, testing, maintenance and operation of real-time control systems. While the focus was on the fundamental aspects of the methodologies and technologies, there were some applications papers which helped to put emerging theories into perspective. The four main subjects were architectural issues; knowledge - acquisition and learning; techniques; and scheduling, monitoring and management. For systems engineers and computers scientists.